Poorboys World QD+ (Quick Detailer Plus) was a name Poorboys have used in the past, and they’ve brought it back with an all-new formula with light cleaners, wax, polymers, and an intense gloss with unmatched slickness. 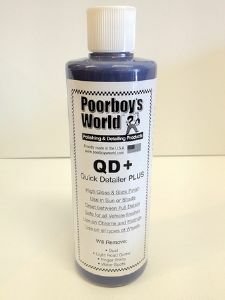 Poorboy’s World QD+ (Quick Detailer Plus) cleans and protects your vehicle any time, anywhere. Poorboy’s unique formula contains real Brazilian carnauba and polymers to give your vehicle a quick boost of shine and protection. QD+ helps reduce fading and oxidation with regular use. QD+ (Quick Detailer Plus) is the perfect detail spray for touch-ups and waterless washing. Just spray and wipe to remove light dust, fingerprints, smudges, and smears. The carnauba and polymer formula leaves a slick, protective coating on the paint that resists fading and oxidation. Use Poorboy’s QD+ (Quick Detailer Plus) after each wash to prevent water spots. As you towel dry your vehicle, mist the paint with QD+. The polymers and carnauba will restore the gloss while removing fresh water spots. Poorboy’s QD+ (Quick Detailer Plus) is an easy on, easy off product. Apply it in the sun or shade, on a wet or dry vehicle! Just spray and wipe to instantly clean the paint and improve its shine.